For Livestock and Poultry Contains .25% Permethrin to control horn and face flies as well as lice on horses, beef and dairy cattle and swine. For use in dust bags, shaker cans, and mechanical dust applicators. 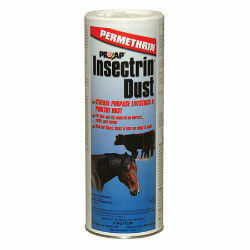 Direct application: Cattle and horses dust with 2 oz Swine dust with 1 oz 5-day slaughter withdrawal for swine. Can also be used on dogs and cats or in cracks, crevices and bedding (for fleas, ticks and lice).